Between a grade 2 listed property and a separate wooden outbuilding lies the garden. You enter through a pair of beautiful, bespoke Iroko hardwood gates. To either side are brick planters housing a Beech hedge. Riven sandstone paths lead you through green oak arches, to oak and brick seats and a large raised dining area. A pair of water chutes and traditional cottage planting complete the picture. Know your gravelsGravel comes in many sizes and is essentially small pieces of stone. It can form naturally over time by the action of water on rock, creating the lovely rounded pebbles we associate with beaches and rivers. This is generally known as pea gravel.It can also be man-made, formed from crushed rock, which makes it angular and sharp, and varying in size from very coarse down to fine grains. These two types of gravel have some fundamental differences. Pea gravel has a lot of subtle variations in colour, so it will never look flat or boring, whereas crushed stone tends to be more monochromatic.Pea gravel is also softer underfoot than crushed stone – a consideration for bare feet, children and pets. Crushed stone ‘beds in’ better, whereas pea gravel requires an edge to keep it in place. Get some samples of gravel before deciding which one is right for your space and also consider the size. Larger pieces add more texture but are less restful on the eye and are harder to traverse. Gravel that’s around 1cm is ideal.The type, size and colour of gravel you choose can have a fundamental effect on the appearance and feel of your outdoor space, so consider carefully the look you want to achieve, whether it’s simple and serene or bold and modern. Create a path using gravelA brick or concrete path can be an expensive way to landscape your garden, so create a pathway using gravel instead. Mark the area out with string, then dig up any turf, rocks or plants. Pat the soil to make it compact, then put down a layer of permeable membrane. Finally, scatter over your gravel and spread it out with a rake. In this beautifully landscaped garden, they’ve also added some simple timber slats to the gravel path. Combine it with sleepersRailway sleepers have a great country-meets-modern rustic feel. They’ve, unsurprisingly, been growing in popularity in gardens, and are used in a number of ways – from bordering beds to defining a pathway as here, teamed with gravel again.Look for reclaimed sleepers or simply buy new ones that still have a vintage feel (there are lots around). Always make sure timber is treated so it won’t rot or decay. Also consider using wood-effect sleepers cast from concrete. They are easier to look after and less slippery. Mark out a pathThin slivers of railway sleepers set into crunchy gravel provide a practical and charming walkway in this country-style garden. They’re a nice angular alternative to traditional round stepping stones. 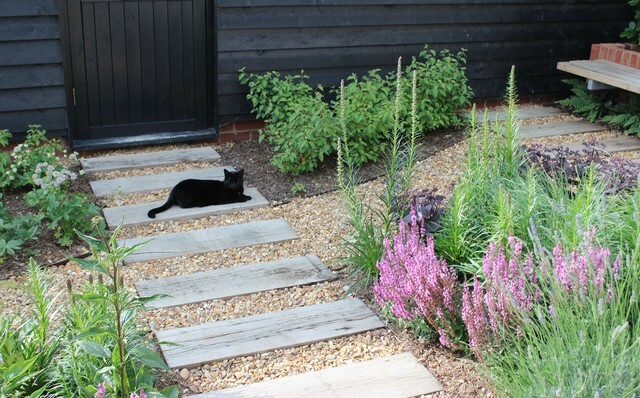 Ask a pro to help install a path like this if you’re not a confident DIY-er, as the sleepers will need to be firmly set into the ground to ensure they don’t shift when walked on. The path is good but replace the gravel with foliage.